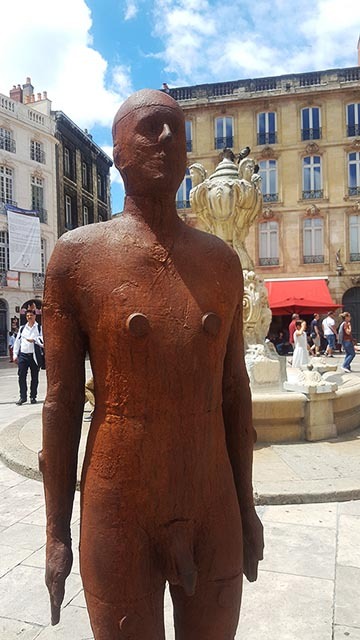 As part of the Bordeaux Métropole Cultural Season 2017named "Paysages" (=Landscapes), the British sculptor Antony Gormley exhibited 16 identical statues in the city. The goal of the game is to find them all! I entered into the game and I started my collection of photos! What about you, will you find them all scattered in the city by the British sculptor ? Until October 25, 2017, many cultural events will celebrate the arrival of the very high speed train line in Bordeaux-Saint-Jean station. Since 02 July 2017, passengers of the TGV Paris-Bordeaux will be able to make their journey in only 2h04! Either a saving of time of more than an hour! Accelerating the movement speed will change our perception of the landscape around us, experiencing new visual sensations through the window. 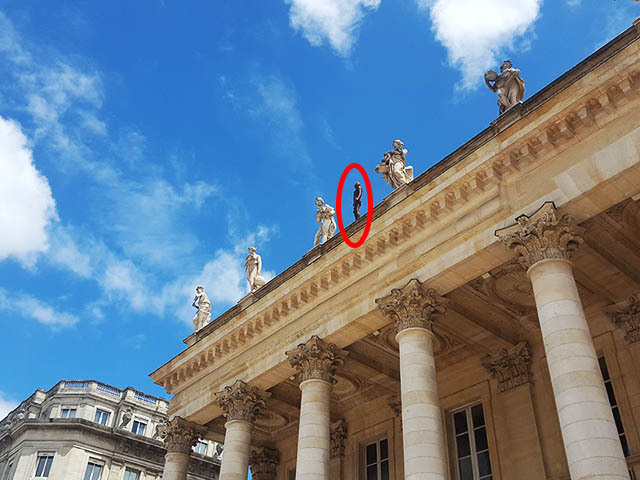 This is the starting point for the thematic reflection of this new cultural season, entitled "Paysages", imagined by the city of Bordeaux urban metropole to celebrate this shortening of time. 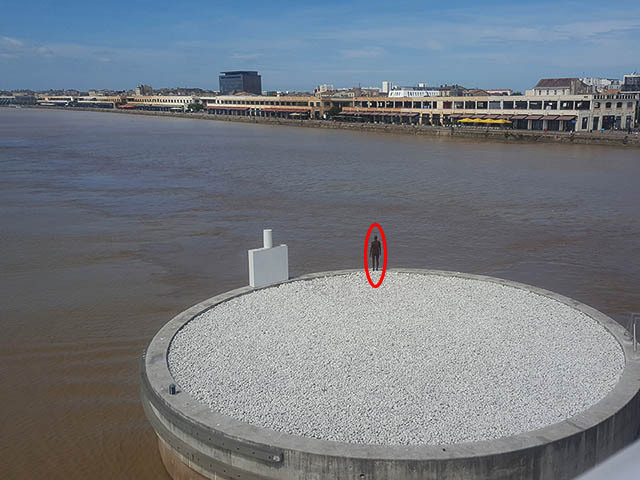 Among the 500 artists involved in this cultural season from June 24 to October 25, 2017 (No less than 100 cultural events: 4 months of concerts, exhibitions, performances, films, dance performances ...), we find Anthony Gormley. Le Centquatre in Paris was offered a carte blanche to transform the public space with the works of 3 artists and stimulate the look of the walkers in order to attract a new look at their urban landscape of their daily life. 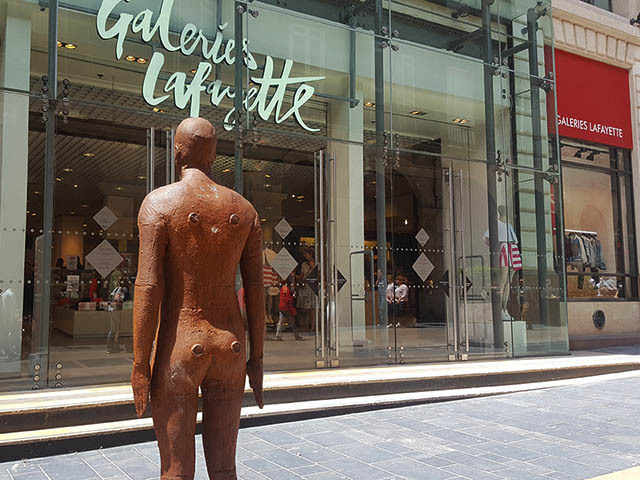 Thus, the British sculptor Antony Gormley exhibited 16 identical anthropomorphic statues in the city. The goal of the game is to find them all! I entered into the game and I started my collection of photos! What about you, will you find them all scattered in the city by the British sculptor ? Some will say that they are convinced that the sculptures change place ... It is unlikely that these bronze statues will move since they still weigh nearly 700 kilos. Since they have no base, they have to be secured, sealed in the floor! 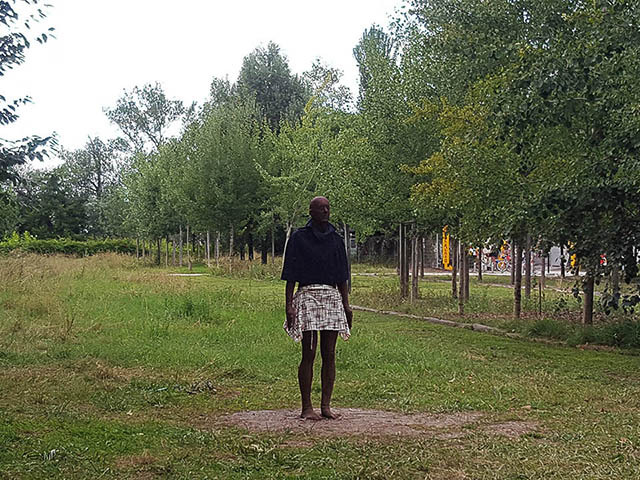 "The Gormley project provokes this intimate dialogue with the urban landscape, avoiding any monumentality and forcing the passers-by to stop their gaze on places that they pass though everyday. 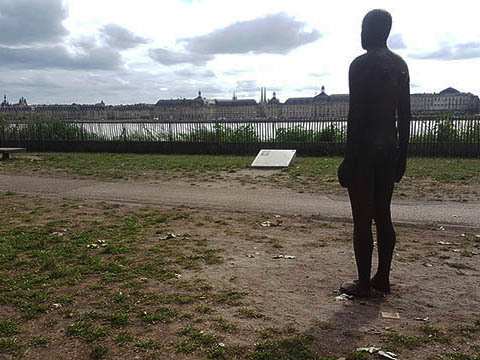 It is important to reveal the multiplicity of this city, which is what this sixteen sculptures trail, "
But who is Anthony Gormley? A British sculptor born in 1950, Anthony Gormley is the author of the famous Angel of the North in Gateshead: a steel sculpture of an angel whose wings measure 54 meters in size (1998). The work of Antony Gormley revives the image of man through an exploration of the human body as a space of memory and transformation using his own body as subject, tool and material. He often uses his own body as a reference, going so far as to make molds of which he uses as a base and model to realize his creations at different scales. "an attempt to materialise the place at the other side of appearance where we all live." or "the closest experience of matter that I will ever have and the only part of the material world that I live inside." The aim is to question ourselves about our relationship to time and space and the place our bodies hold. He is certainly one of the most recognized English contemporary artists. Antony Gormley is considered one of the greatest artists of the contemporary contemporary art scene. What makes Antony Gormley's success? Maybe the apparent simplicity of his work: metallic bodies carved very often at scale 1/1. These men amaze at the same time by their supposed heaviness and the grace which emanates from them. Many of them are exhibited around the world and have also been the subject of spectacular exhibitions, as this year for the cultural season 2017 of Bordeaux entitled "Landscapes".